JEANNE: YOU HAVE HELPED ME MORE THAN YOU KNOW. HAVING TO REALLY FEEL ALL THE FORMER & CURRENT PAIN IN MY LIFE BECAUSE OF NO MEDS IS REALLY HARD FOR ME. NOT BEING ABLE TO NUMB MYSELF OUT TO NOT THINK ABOUT THE PAIN IS SO HARD & PAINFUL. BUT YOU ARE SO RIGHT THAT ALOT OF WOMEN HAVE A STORY TO TELL. MY COUNSELOR SAYS I AM SO NOT ALONE IN THE THINGS I TELL HIM-THAT HE HAS SO MANY CLIENTS THAT TELL THE SAME OR SIMILAR STORIES TO HIM! THIS COMFORTS ME, THOUGH IT’S SAD THERES SO MUCH SADNESS AND DEVASTATION IN THE WORLD. I KNOW I HAVE TO PRACTICE RADICAL ACCEPTANCE IN MY LIFE NOW AS MY COUNSELOR SAYS AND FORGIVE MYSELF & OTHERS, EVEN THE DR’S WHO RUINED 25 YRS OF MY LIFE AS WELL AS THE LIVES OF SO MANY OTHERS. YOU ARE A SPECIAL AND GIVING ANGEL WHO DESERVES THE BEST LIFE HAS TO OFFER. I SO WISH THERE WERE SO MANY MORE PEOPLE LIKE YOU IN THIS WORLD!! WHAT A WONDERFUL WORLD IT WOULD BE! KATHY AT RDD AS WELL AS THE ANGELS WHO TOOK CARE OF ME, AND THE PARAMEDIC, JIM AND GARRY TOO ARE WONDERFUL EXAMPLES OF KIND AND SO GIVING AND EXCEPTIONAL PEOPLE THAT IT GIVES ME HOPE THAT I CAN FIND KIND PEOPLE HERE IN ROCHESTER, NY TOO. I WANT TO TELL YOU THANK YOU AGAIN FOR YOUR KINDNESS, YOUR WISDOM, YOUR GREAT ADVICE, AND FOR SAVING MY LIFE. I STILL CAN’T BELIEVE IM OFF THE FENTANYL AND HAVE NO WITHDRAWAL SINCE THE DAY OF THE DETOX! WHAT A MIRACLE AFTER 25 YRS OF DAILY USE OF OPIATES!! I NEVER THOUGHT IT WOULD BE POSSIBLE TO DO THAT!! AND THANKS TO YOU I HAVE BACLAFEN FOR MY CHRONIC PAIN. YOU ACCOMPLISHED WHAT DOZENS OF DR’S COULDNT FOR 25 YRS!!!! NOT ONE SUGGESTED BACLAFEN FOR ME!!!! YOU ARE A TRUE ANGEL!! THE WORK YOU DO FOR SO MANY PEOPLE IS SUCH AN ACCOMPLISHMENT; YOU DESERVE TO BE REWARDED DAILY!! THANKING YOU ISNT ENOUGH, JEANNE, YOU’VE DONE SOOO MUCH. FOR ME AND SO MANY OTHERS. 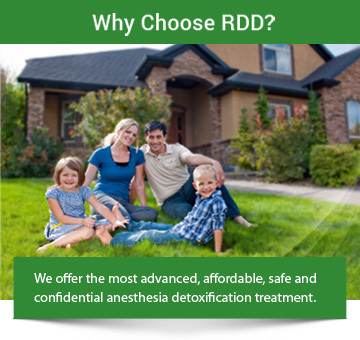 RDD IS A BLESSING FOR THOSE WHO FINALLY WANT TO BE DRUG FREE AND SEEK HEALTHIER ALTERNATIVES FOR CHRONIC PAIN AND FOR THOSE WHO WANT TO END THEIR DEADLY ADDICTIONS TO RECREATIONAL DRUGS. THERES ONLY ONE DESTINATION FOR THAT KIND OF LIFESTLY-MISERY & DEATH. AND FOR THOSE THAT USE DRUGS RECREATIONALLY-ESPECIALLY THOSE I MET AT RDD WHILE I WAS THERE , THEIR CHILDREN & FAMILIES WILL SUFFER AS MUCH OR EVEN MORE THAN THEY WILL. MY HEART BREAKS FOR THE KIDS OF THOSE WHO USE DRUGS AND SO CARELESSLY & THOUGHTLESSLY DESTROY THEIR’S AND THE LIVES OF THOSE AROUND THEM! PEOPLE LIKE YOU & THE OTHERS I MENTIONED WHO WORK FOR RDD, HAVE CHANGED MY LIFE AND GIVEN ME HOPE. I HONESTLY NEVER THOUGHT I COULD GET OFF THAT FENTANYL PATCH AFTER 11 YRS OF BEING ON IT AND 4 YRS OF OXY CONTIN AND 7 YRS OF VICODIN & TONS OF CODEINE!!! THE RDD Method™ IS NOTHING SHORT OF AMAZING!!!!! THANK YOU AGAIN JEANNE FOR BEING THE ONE TO ALLOW ME TO GET THIS PROCEDURE. I SINCERELY DOUBT I’D BE ALIVE IN A FEW MORE MONTHS IF I HADN’T DONE THIS. RDD IS A LIFE-SAVER, PURE & SIMPLE! !